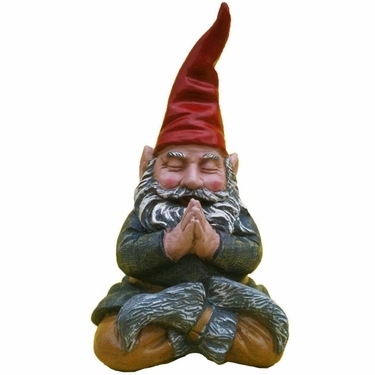 With chakras aligned and sitting in full lotus position, our Zen Mordecai meditating garden gnome statue finds his inner peace and singularity is the beauty that is nothing. Strive towards tranquility and nirvana in your garden with the helpful calmness of this whimsical and wise meditating gnome! Sculpted in cast resin and hand-painted with loving detail our Zen Mordecai promises to continue on with his meditation wherever he is placed; in the home, garden, office, or yoga studio! Complete the garden meditation with his meditating companion, Zen Zelda! The pair makes an incredible gift for anyone that enjoys humor and meditation, or that just needs a little more inner peace in their life. Size: Sits 9.5 inches tall. Endlessly deep and inspiring.